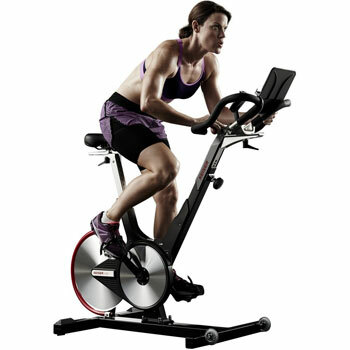 Exercise bikes are one of the most popular forms of equipment for the home because they seem so easy to use. 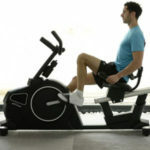 Here are 7 tips for your exercise bike workouts to point you in the right direction. 1) Choose the right bike before you even think about the workout. 2) Find the right posture on this new bike for the best results. 3) Make sure that you adjust the bike properly to suit your shape and needs. 4) Work on a steady, productive motion with the right resistance and RPM. 5) Once you have a good motion and are in tune with the bike, try some interval training. 6) Keep an eye on your comfort levels while riding. 7) Take your time for steady progress and goal tracking. We can sit down and pedal away for as long as we like and appreciate the gentle, low impact motion. But, are we really getting the most out of our sessions? There is a right way and a wrong way to get a productive, fat burning session from these machines and meet your goals. 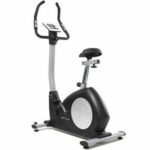 First of all, it is important to remember that the best workout for your fitness needs comes from the right type of gym bike. On the subject of finding the best fit, it is important to find the right posture while riding. This is one of the best ways to be sure of a safe, productive session. Try and make sure that 60% of your weight rests on the seat and 40% on the handlebars. Don’t lean back too far, but don’t tense up around the arms either. The best posture and weight distribution helps with form, comfort and tone. It means that you can work the core as well as the legs. Of course this doesn’t apply to recumbent bikes in the same way, but all models require the following. One of the best ways to achieve this posture is to adjust the settings on the static bike so that you are naturally in the right position. This means adjusting the seat height, position and the angle of the handlebars. This isn’t so important on a personal at-home machine as long as you get it right the first time. This is more for those that share machines with other family members or work out in the gym. Learn how to move the seat and handlebars to the right position and don’t settle for something that feels wrong. A seat that is too high is unsteady and a problem when trying to reach the pedals. These adjustments and your posture on the bike machine make it much easier to create the ideal motion for tone and weight loss. The best machines will have RPM counters and variable resistance to help you find a good circular motion. it is better to have a good amount of resistance from the flywheel to create the right motion on the pedals. Go too low and the workout will be ineffective. It is important to find the right level of resistance and keep up that smooth motion and beneficial RPM. However, this doesn’t mean that we should always work to the same level. It helps to change things up to push towards our goals and test our limitations – if only for a short period. This is where some strong High Intensity Interval Training really pays off. Push hard for a short period to get the heart pumping and increase the RPM, and then slow things down on recovery. Interval training like this is challenging, but it is also proven to work wonders for fast results and great fat burning. Try and do this standing up as well for greater impact. A comfortable seat means more than one that is simply raised to the right height. A common complaint with many exercise bikes is the shape of the seat and the lack of padding. There are two solutions here. Either a gel pad on the seat for extra cushioning or padded shorts. Padded shorts are not the only item of clothing to consider here. Cycling shorts and cycling shoes of any kind are preferable for long-term training to avoid discomfort and chaffing. As for hydration, it is easy to overlook this need while balancing your weight on the handlebars and concentrating on your RPM. But, it helps to keep a water bottle close by. Some that work out at home also suggest switching the water for green tea. This drink is healthy anyway, due to the antioxidant count. But, studies also show that it can help with fat burning when drunk before or during a workout. Once you have the right posture, settings, clothing and other helpful factors under control, you can focus on progressing with your workout and tracking your goals. 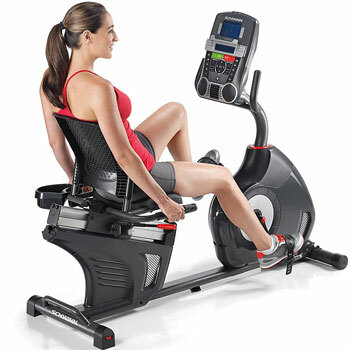 The best exercise bikes have consoles that are full of information on the session and your progress. You can track your RPM, distance travelled and calories burned. It is important to take note of the data, but don’t get too consumed by it. 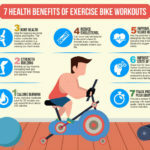 As you can see from the other tips in these 7 tips for your exercise bike workouts, good form and steady motions require the majority of your concentration. Don’t fixate on the lack of distance and mess up your RPMs. Don’t fixate on the lack of calories burned and risk pushing too hard. Where possible, put the numbers out of your mind and enjoy the ride.